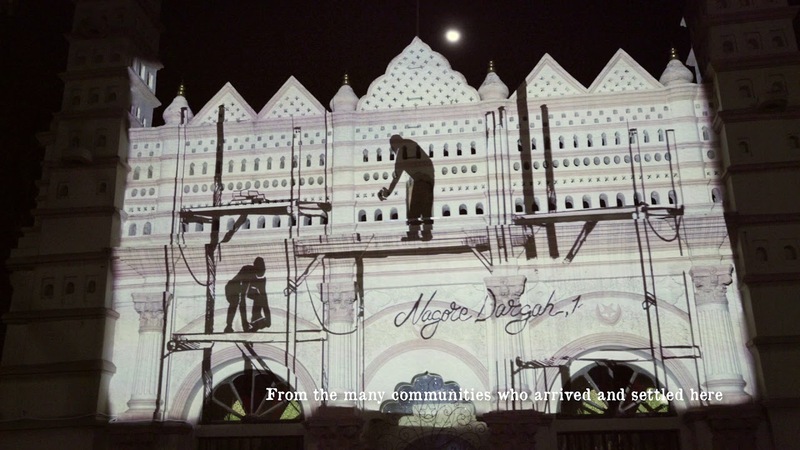 The lesser known stories in Singapore’s long and vibrant history come alive through a series of seven light projection installations across the city centre. Discover long-forgotten places, watch as the darker moments of our history unfold, and learn about those who made a difference in our history. The light projections will launch on 15 March 2019, Friday, and will run every Friday, Saturday and Sunday from 7.30pm to 11.30pm until 7 April 2019, Sunday. For the list of stories and projection locations, download the map, or read on below. Delve into the story of a bustling port-town in the early 1800s at Gelam-Rochor-Kallang, which housed a royal citadel and palace at its heart. Stretching from Victoria Street to the edge of Kampong Glam, this entrepot drew traders from around the region and was home to the different communities and craftsmen that settled there. Revisit Singapore’s original coastline at Telok Ayer Street, where many immigrants first landed on our shores in the years following 1819. As testament to their diversity, they went on to build different places of worship in thanksgiving for their safe passage here. These would later become the places of worship that still stand on Telok Ayer Street today. Much of Singapore’s early development was a result of the blood, sweat and toil of coolies and Samsui women, who formed the backbone of our labour force. Yet, for all their arduous work, these unsung heroes remain unnamed today. This is a tribute to their story. This is the story of Naraina Pillai’s contribution to Singapore and the Indian community. Arriving in 1819, Pillai became Singapore’s first building contractor and the owner of a large cotton business – but not without its challenges. Despite this, he went on to build the Sri Mariamman Temple. Uncover the story of the once rampant opium addiction in Singapore in the mid 1800s that gripped Chinese immigrants. The site of Shaw Tower was once where an opium shop stood. Discover how doctors and philanthropists Lim Boon Keng and Chen Su Lan were determined to stamp out opium addiction for the good of the Chinese community. Indian convict labourers arrived in Singapore in the 1800s. Not only did they clear land and reclaim swamps, they were also instrumental in building key landmarks such as Kampong Glam, St Andrew’s Cathedral, and even the Istana. They were hardworking and when they had completed their sentences, many settled here and married local women. In the early 1800s, secret societies promised Chinese coolies support and kinship in a foreign land. But over the years, rivalries started to form between them, leading to riots. Coolie abuse also became more common. William Pickering, the first ‘Protector of the Chinese’ was appointed to stop coolie abuse and regulate secret societies. The Old Hill Street Police Station was built to deal with the increase in secret society activities. Be sure to reserve your tickets early for this immersive experience that showcases key moments in Singapore's 700-year history.